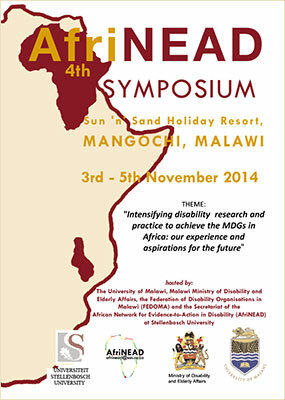 The Faculty of Social Science of the University of Malawi in Collaboration with the Ministry of Disability and Elderly Affairs, the Federation of Disability Organizations in Malawi (FEDOMA) and the Secretariat of the African Network for Evidence-to-Action on Disability (AfriNEAD) at Stellenbosch University in South Africa is calling for abstracts for the 2014 AfriNEAD Symposium which will take place from 3rd to 5th November 2014 at Sun and Sand Holiday Resort in lake-shore district of Mangochi in Southern Malawi. The theme for the conference is: “Intensifying disability research and practice to achieve the MDGs in Africa: our experience and aspirations for the future”. The deadline for receipt of abstracts was 31st March 2014, but has been extended. The abstracts should be submitted to the following email address: afrinead-conf@cc.ac.mw. Abstracts should clearly state, the research title, background, objective(s), methodology, results, conclusion and key words.Abstracts should not exceed 300 words. Notification of acceptance of abstracts will be sent on 2nd May 2014 and full papers will be expected before 31st July 2014. The registration fee for the AfriNEAD 2014 symposium per delegate is US$370 for those who register by 31st March 2014. Those who register after this date will pay US$470. Conference organizers will not provide accommodation but researchers are advised to book their accommodation at the following hotels: Sun and Sand Holiday Resort, Andrews Motel,Boadzulu Holiday Resort, Nkopola Lodge and Club Makokola. The rates for these hotels will be communicated by end of January 2014.